It's morning. Sunlight and a strange sound wake me in my sleeping bag. Where am I? What's happening? â€¦the sound of a thousand howling huskies reminds me â€“ I'm in Greenland! This is the beginning of one of the greatest adventures of my life. It actually really began much earlier, though. Tor had been dropping hints about a trip to Greenland for several years. On my bulletin board there was a news cutting regarding Hvitserk's paddle trips to East Greenland. Tor had sent me the cutting and written "Anders! When do we go?" on it. This winter, the idea became reality. We decided on a date and destination, and ordered tickets. We were to leave in the middle of August for Ilulissat in Disco Bay, where we had two weeks available to go on as many kayak trips as possible. Tor and I both enjoy paddling on the open ocean, and the first question of the trip was what kayak to use for such a trip. 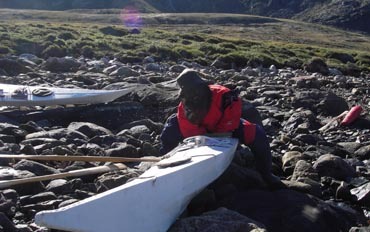 Both of us prefer original Eskimo skin on frame kayaks, so that was not a problem. But to Greenland? We agreed that Greenland kayaks would be the best way to experience this country. Friends of friends lent us Greenland kayaks in Ilulissat. The kayaks were medium-sized and would probably be about the right size for us. We hoped so and continued planning. The rest of the planning was fairly simple. We brought food for most of the trip and fishing tackle, backpacking stove, tent, sleeping bags, etc. A water temperature around freezing meant that we would be paddling in drysuits, which have almost no side effects on such a trip. It would be convenient to bring our own paddles along. 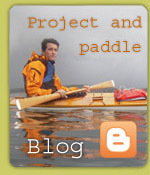 We mused for quite a while on how to split a good paddle to bring it on the plane. This turned out to be unnecessary, as there was no problem bringing a 220 cm paddle aboard the plane. We had read the travelers' guide "Turen gÃ¥r til GrÃ¸nland" from the publishing house 'Politiken'. Here we found a lot of useful information. We ordered a map, scale 1:250 000, which was excellent to plan from and paddle with. We talked to people in Ilulissat before the trip. We received a lot of good advice, and some occasionally contradictory advice about weather, wind, current, ice, and other things that non-local paddlers should learn. Then we simply had to wait. My first glimpse of Greenland was quite an experience. The plane left from Gardermoen with stops at Copenhagen and Kangerlussuaq. We saw the inland ice in all its majesty, preposterous quantities of ice, decorated for the occasion with black nunataks. The country was just as magnificent to look at. Deep fjords and endless mountain chains with no sign of human activity stretched out before us. The country was utterly pristine when viewed from above. From Kangerlussuaq we flew north to Ilulissat. We spent some time in Ilulissat going over the last details. The kayaks needed some maintenance, and we had to buy a little food. We met helpful, friendly people, and got a few more tips along the way. On August 16th we transported ourselves and the kayaks to the water with a Toyota pickup. We placed the kayaks on the roof and pulled a rope through the open windows and right across the kayaks. Tor sat in the box behind the cab and held the kayaks in place. After this spectacle, everyone in town knew that two crazy foreigners were going kayakking. Then came the big moment. Would all the luggage fit in the kayaks? This was one of the great questions of a trip. Incidentally, we had a few spectators. A woman came up to me and asked, in Danish, "Are you bringing the Norwegian?" and another looked at the luggage and asked "Are you really going to bring all that along?". 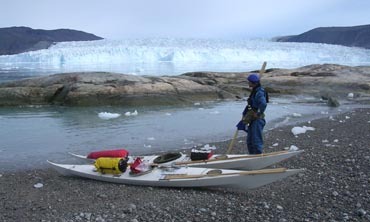 Some Greenlanders came along too, inspected our kayaks with knowing looks, glanced at our map, and gave a few tips. 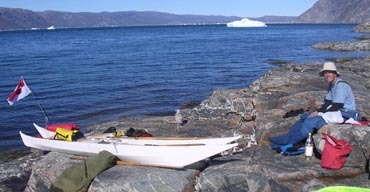 Even though there are a lot of kayaks in Ilulissat, people don't go on kayak trips very often. If you plan to travel somewhere, a motorboat is more practical, after all. The locals waved and wished us 'bon voyage' as we set out. The first strokes were fantastic. It was afternoon and there was a little sun. The sea was clear as glass, with low swells â€“ we couldn't have asked for much more. The first ice appeared shortly after. We had to go and touch it. We didn't paddle far the first evening, as the mist rolled over us and the floes began to appear more regularly, forcing us to land. The landscape reminded us mostly of Svalbard. The distances are great and the mountains tall. There are no forests, and the land resembles Norwegian mountain areas. Imagine moving northern Norway, from the treeline and up, down to sea level, and you have Greenland. The temperature is also similar. During the day it was usually 8-15Â°C, down to -5Â°C during the night. The weather varies a lot. It can be rainy, windy, or sunny and calm for weeks at a time. In Disco Bay, we were told that it could be foggy for quite a while, but we were lucky enough not to experience this first-hand. The tides are about 2-3 metres high, which naturally leads to quite a bit of current. We found this out for ourselves in the Pakitsoq fjord, north of Ilulissat. The fjord is 30 km long, but the entrance is a bottleneck only 100 metres wide. We paddled into the fjord during high tide, and didn't notice anything. When we later paddled out, the tide was running out, something you couldn't notice from inside the inlet of the fjord. At the inlet itself there were meter-high standing waves. I weighed my options for a while, and ended up carrying my kayak past the strongest part of the current. Tor took a chance and paddled through, and I've never seen a kayak going that fast before! Perhaps the most unusual thing that you don't see in Norway was the ice. There were all sorts of ice. We saw drifting icebergs, small lumps of slush ice everywhere, thin sea ice, and large glaciers calving into the sea. Near Ilulissat is also a spectacular ice fjord, a fjord filled with compressed ice for tens of miles. At spring tide, the edge of this ice comes loose and drifts into Disco Bay. We wondered a bit about how dangerous the icebergs were. We usually kept our distance, but became slightly braver as the days passed. On one of the last days, we were close to a large iceberg, when we heard a loud rumble from inside the ice. We paddled away as fast as we could, hearts racing, but nothing happened. We also saw icebergs tipping over, icebergs splintering, and a variant of this where bits of the iceberg broke off at the bottom and drifted up to the surface. This was something we had to be aware of. Perhaps one of the most beautiful places we visited was Equip Sermia â€“ the Equip glacier. We camped right above the 5 km long ice front that was continually calving. Occasionally, when large pieces broke off, tsunami-like waves washed over the shore below us. The animal life in the area is exciting. We noted a large number of birds, polar variants of the seagulls we're used to from home, razorbills, little auks, ravens and many others. There were many seals, too, but we didn't see any whales. Later we learned that had we paddled one day south of Ilulissat, we would have been sure to see whales. We saw winches and whale bones in several places, evidence of these animals being hunted. As for land mammals, everyone at home talks about polar bears, which are not present in Disco Bay at all. (For which I am truly thankful). I suppose man-eating predators make a trip more exciting, but also more complicated. There were a few semi-domesticated polar foxes, too, and one even visited us in our tent, looking for something to eat! Most guidebooks state that the insects can be a problem. We didn't notice any mosquitos or midges, but we encountered a small white-legged fly, which the Greenlanders call "he of the white kamiks". They appear in large numbers, and can be rather annoying, but they don't bite or sting. We found several traces of old dwellings - there were a number of abandoned settlements in Disco Bay. We also found the remains of peat houses, stone piles and some stone chests that had been used for storage or burial. All our gear worked as expected. Little of what we brought was unnecessary, and we didn't miss much. We didn't need the portable stove as much as we had expected, as there was dry heather and dwarf birch in many areas. So we did like old Greenlanders: piled stone slabs up against each other and put the kettle on top. The fire kept the flies away, didn't make much noise, and kept the cook warm. Meeting people was also an experience in its own right. Of course, most Greenlanders are of Inuit origin, but there are many Danes and people of other nationalities. We got the impression that time flowed slower there, people lived at an unhurried pace, and didn't rush. The society seemed well-ordered. There was socialized medicine and Social Security, excellent communications, schools, and a good selection of merchandise in the shops. However, there are still problems with unemployment and the consequences of this. In my opinions, Greenland is a wonderful place for a trip! I recommend it to everyone who dreams of an adventure. However, there are a few things which make Greenland a difficult place to travel to. First, the ticket is fairly expensive when compared to similarly distant destinations. Air Greenland has a quasi-monopoly on flights there. The trip may be cheaper if you go by way of Iceland. Making an arrangement to borrow equipment can be difficult in smaller towns. 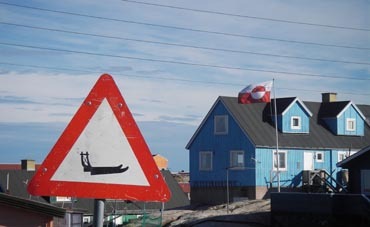 Several travel agencies in Ilulissat were willing to help us with this. Maps are easily available from local tourist bureaus. But in the end, you have to travel with an open mind, and expect that not everything will be the same as it is at home. Not everything is clean and well-organized. Some hate this and others love it. I'm more in the latter category. I am convinced that this was not my last trip to Kalaallit Nunaat â€“ the land of men.